Ichi is a lone goze (blind woman singer) who has become separated from her traveling entertainment troupe. Wondering how she will find her place in life, she carries only a shamisen (a traditional Japanese stringed instrument) and a walking stick with a hidden blade inside. When necessary, she uses her exceptional sword skills to fight off yakuza and other villains. The setting is about historical Japan and its reluctance of accepting foreigners to open up markets and trade possibilities for economic stability. Some don't mind the yellow haired barbarian monkey savages infringing on their land but others hate them. 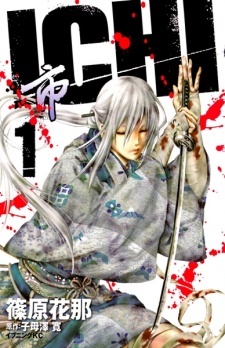 The titular Ichi is a blind swordswoman/goze who does odd jobs around the house and eventually gets involved in a political scheme with Japan's future on the line. That and she fights a battle against herself to overcome a past trauma. As it was set during the days when some right wing samurai extremists did not take to the foreigners too kindly, there is a good bit of action to complement the historical accuracy. Feels like a history lesson really, with a few text bubbles showing the status quo of Japan's political and economic stability as well as major events that influenced change. The art was outstanding, but my biggest gripe about it is that all of the important characters look the same. Some of Ichi's acquaintances got a good bit of characterization but I forget which long haired pretty boy it was. The art style had me a bit confused, so I recommend remembering the names of each characters so that you understand who did what and what is going on. Don't do what I did and read this with your brain turned off. The plot started out really well, I liked the idea of a blind female assassin (I thought that was pretty original) slashing random people up. Except that the story stopped there: there wasn’t any plot development nor character development beyond this that made sense. You saw the author introducing new ideas for a couple of chapters (like shifting from I’m-a-heartless-killer to we-all-need-friends-!) and then introducing more new ideas; there was very little consistency and depth. And the longer the story went on, the less realistic these new ‘ideas’ became. At one point, all the major assassins were blind! I could only think: really? Did Japan run out of assassins? The characters, if anything, degenerated the more volumes I went through. I was remotely satisfied with the first bunch of characters we had, but then (yes, Author, BUT THEN!) we had MORE characters introduced that didn’t add to the plot AT ALL. They were all cliché and had very little personality substance. Especially the useless female characters, because we all know why they're there (hint: it has nothing to do with the story). I found it difficult to be moved with the 'awe-inspiring' scenes because I found all the characters by the end of the story to be ANNNNNNNNNOYING. The art detracted from the Manga. The lack of detail was appalling and this fact is emphasised more by the lack of story development and the 2D characters that could have distracted the reader from noticing the illustration’s plainness. It had very little proportion and texture: there were the huge eyes and the wispy hairstyle that never changed. Even though the setting was in 19th century Japan, and the entire plot was about killing the foreigners, it was the main characters (strangely, the side-characters were accurate) that had Western modern hair. I hope you can appreciate the irony in this. And there wasn’t a single scene where the characters bathed! So I know that their hair was greasy as Hell and had lice and crap living in it: it shouldn’t look blow-dried 24/7. Lastly, the special effects: no, just no. There were random blood drops of doom splattered everywhere, even when someone was angry (really, I've never seen anyone draw blood from just being angry). In conclusion, this Manga made me want to peel the skin off my face from frustration. I don’t like it when the author has a good idea (enough to get me going) and then tortures me with bad plot arcs later on in the series. Can’t recommend it, it’s a real bad waste of time.